Back at the end of last month, you may recall a special SBC offer, whereby anyone who joined our service during the final week of May would enjoy a 1-month free trial with 3 top racing tipsters for the whole of June. This was a unique deal to help celebrate the ongoing Horse Racing Bookie Apocalypse that has been a feature of recent SBC reports. …And the great news is that with 29 days of betting down for June already – 2 of the 3 tipsters have made absolutely outstanding profits this month (with the 3rd showing a small loss) so anyone signing-up at the end of May will have enjoyed a very successful start to their SBC membership. To put this into numbers – the best tipster in June has made a 49 pt profit from 46 pts staked(That’s a 106% ROI!! ), whilst the second best tipster is up 13.90 pts profit from 102 pts staked (14% ROI). The 3rd service has made a small loss of just -13.8 points at a ROI of -2.10% only. Overall if following all 3 tipsters for free, June would have been very profitable indeed. But this email isn’t to simply rub your nose in it for missing out on this offer – far from it! Because we have agreed another deal with the 2 most profitable tipsters in June to run a very similar free trial offer for anyone joining SBC between NOW and Midnight this Sunday the 5th July. That’s right – simply subscribe to SBC before this deadline and you can enjoy the free trials as detailed below from these 2 top tipsters (Plus not forgetting that you will also enjoy all the many benefits available to you as a Smart Betting Club member on top!). Your 2 Free Tipster Trials…. Free 1 Month Trial With James Boyle Racing. James has kindly agreed to extend his offer so that anyone who signs up between now and Midnight on the 5th July will enjoy a free 1-month trial of his excellent service. This trial will begin on Monday the 6th July for exactly 1 month. Alongside a long-term record in excess of 24% ROI from 1100 bets since 2011, in June alone, James is the tipster who made a 49 pt profit from just 46 pts staked. That equates to an ROI of 106%. What makes this performance even more special is that earlier in June, he actually was admitted to hospital to have his appendix urgently removed. Like a real trooper, James missed just 4 days of tipping and since his return (minus appendix) he has been firing winners in left, right and centre. This makes sense as the Flat is James’s real speciality, so its a great time to start following him. Free 2 Week Trial With Northern Monkey Punter. Northern Monkey is without doubt one of the most popular racing tipsters amongst SBC members and it’s easy to see why. It’s a supremely easy to follow service with first class customer service, all of which combined with the 11.3% ROI generated since February 2010 on their bets, makes it a firm SBC member favourite. Given its popularity, we have negotiated an extra special long-term offer whereby any SBC member can enjoy a free 2 week trial of this service at anytime whatsoever. There is no time deadline on taking up this offer as if forms part of our Tipster Savings set of benefits whereby SBC members can enjoy free trials and exclusive discounts on many top tipsters. However, given the fact this is a service in excellent form, many of you may want to take up the free trial during July and strike while the iron is hot! PLUS Exclusive Savings (Coming V.Soon) Morning Value Service. Whilst the final tipster that formed part of our offer last month (Morning Value) was not able to repeat the profits in June (making a small 13 pt loss at around -2% ROI), they do at least have a fantastic record dating back to 2011 of 1700 pts profit at a shade of just under 10% ROI. They might not have hit their usual heights in June yet it won’t be long before they are back in the winning groove. They will not be repeating their one-month trial option this month, but we are shortly due to announce an extra special discount on this service for SBC members only. Grab Your 2 Free Trials. So there you have it – 2 fantastic racing tipster services, both of whom you can follow for free courtesy of this extra special SBC offer. Both of them have made excellent profits during June and most importantly longer-term and are a must for anyone keen to start making more money betting on horse-racing. To qualify for these free trials, simply sign-up for either a Gold or Platinum Smart Betting Club membership today. Don’t forget either that if signing-up before Midnight this Sunday the 5th July, you will get the free 1 month trial with James Boyle Racing. There are no hidden costs or small-print to worry about – simply sign-up today for your SBC membership (Gold or Platinum) and we will do the rest. SBC’s ‘Top Rated Racing Tipster for 2015’ reveals all. If your sink needs unblocking, you send for a plumber. Need legal advice? Find a lawyer. Want to know how to make money on the horses? Then find an expert who does just that, and who better to ask than the winner of the SBC’s ‘Top Racing Tipster of 2015’ award?!? (as voted for by SBC members). That’s exactly what we did in the latest SBC Betting Magazine – Issue 93, as it features an exclusive interview with the man behind SBC members top-rated racing tipster service on the secrets behind his success. We asked him how he goes about finding his selections, how he keeps track of horses that have caught his eye as winners-in-waiting, how he deals with bookmaker restrictions, and much, much more besides…including how he juggles running a tipster service with a full-time role working as a racing journalist. “There is so much racing over the summer that you have to quickly find ways of chopping down the number of races you study and also the number of horses you consider to be betting propositions in each race. I usually look for races that are classified as class 4 and upwards (races can vary from 1 to 7 – best to worst – in the UK) and bet mainly in handicap races, in which the favourites have less chance of winning. In theory, in a handicap race all runners are weighted to have an identical chance of winning, but, based on my knowledge of past races I have watched, I try and find horses that might have run better than their bare form last time out. This happens when horses have raced under unfavourable conditions last time – for example, did a mud-loving horse run on unsuitably fast ground last time? Did a horse finished well beaten but actually run well from a poor draw at a track with a notorious bias. The horses handicap mark (which determines the weight they will carry) might have been dropped, even though they’ve actually run well against unfavourable circumstances. “Firstly, I make sure I buy a hard-backed notebook at the start of every season. It gets a good battering over the course of the year and I’ll get through a couple per season. I write down the list of runners and the race conditions for the race I am betting in. This is what takes a lot of the time – more so than watching replays (because I’ve watched most of the races live previously). I note down race variables such as distance, class and going, and then other non-obvious things such as trainer form. Being able to check back when certain runners have run well when the yard is out of form, is useful at a later point and something the majority of punters won’t bother to check (for example I think Limato can be forgiven his latest defeat as the Henry Candy yard was badly out of form at the time. He runs at Royal Ascot next week). I also note whether the ground looked to be riding as it was officially described. Course clerks have a habit of giving inaccurate descriptions to ensure as many runners as possible turn up to race, but if there is mud flying about then it is worth recording that the ground was soft, as the going may officially go on record as something less extreme – and the majority of punters will refer to that official description in future. After each race I go back to the notes and make a brief line on the race and circle any runners I want to remember for future reference. However, as I cannot bring my notebook everywhere with me, I need an online method of keeping tabs on runners so, so I also use the horse tracker facility on Irish Racing’s website. There are countless others out there, though I like that one as it allows brief notes to be saved online. You get an e-mail whenever your horses have declared to run. Most of the time, though, I have seen the declarations for races at work, and providing the horse is running in the UK, I will be aware of it even before any tracker e-mails arrive. Given declarations are made 48 hours before a flat race, and my Press Association work begins as soon as the declarations come in, I’ve generally had two days to see the declarations for any notebooked runners. “These days I don’t request big liabilities. I have got used to knowing my restrictions with each firm and just play within the set limits. I spread the stakes about plenty but don’t try and take the mickey. Gambling isn’t my primary income – my full-time job is – so I don’t need to stake to the levels a professional gambler would need to in order to turn over an amount sufficient to live off. Last year the service generated about 75 pts profit from 750 pts staked, so if I stake, say, close to £100 per point, a good year like 2014 still creates a nice little side pot (tax free) to top up my main earnings. Several years ago I held aspirations of becoming a professional punter at some point, but then I started a family and my whole outlook on gambling has changed with new responsibilities, even before the account closures and restrictions started and placed a time burden on top of things in terms of getting bets on. The essential tools of the trade our expert uses to source the best value bets. How to cope with the pressure of losing runs and how he always turns things around. What are the most common mistakes aspiring punters should be aware of. How to stay under the radar and keep those valuable bookie accounts open. How to think like a bookmaker, and play them at their own game. Wage war on the bookmakers – The Bookie Apocalypse! In addition to this interview, the latest SBC Magazine also contains independent reviews of two more horse racing services to go to war with. Our first tipster review examines the service with 484% bank growth in 15 months whilst the second review looks at the proven flat expert with 23.3% ROI from over 1000 bets. The latter also comes with a special offer for SBC members of 6 months free if you sign-up with him for 12! Sign up for your SBC membership now and gain instant access to SBC 93 plus a whole lot more! 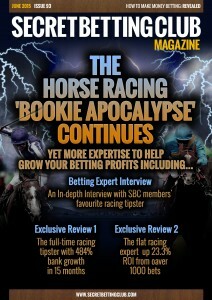 Royal Ascot may be over for another year but for many punters the chance to make money betting on horse racing is continuing apace with the release of the latest Bookie Apocalypse SBC members magazine. In this month’s issue, we have 3 special racing features including an interview with a much-in-demand betting guru on just ‘how he makes money betting’ PLUS our independent reviews of 2 very different yet profitable racing tipsters of real note. As part of our ‘Horse Racing Apocalypse’ special focus, we sat down with SBC members top racing tipster (He was the recipient of their ‘Best Tipster’ gong in the 2015 SBC awards) to find out more on just what makes him so successful. His pathway to becoming a professional punter & tipster. His unique approach to building a daily shortlist of horses to follow. The resources and software he uses to help him identify his best value horses. How to cope with the ups and downs of betting. His advice on staying under the bookmakers radar when betting on horses. All of this and plenty more can be found in SBC 93 – Sign-up for your membership now. In this exclusive review, we investigated a long-running racing tipster service with a detailed record of success focusing on longer priced horses. Tackling bets at an average price of just a shade over 10/1, this expert has made 363 pts profit at a tremendous Return on Investment (ROI) of 23.3%. This has been achieved over the course of 1055 bets since 2011, so is a tipping service that has stood the test of time thus far. With an obvious strength tipping on the flat and all-weather, it’s an ideal service to follow during the summer months, especially courtesy of the special deal available for SBC members only. This deal offers any SBC member who signs up for a 12 month membership a free 6 month extension (worth £240). Effectively ensuring you receive 18 months for the price of 12. Given the exceptional quality of service witnessed by this service and the consistency of profits long-term, this certainly is a tipster to check out. Here at the Smart Betting Club we review all kinds of tipsters with many different strategies for profit – from those tipping up 2-3 tips a week, through to those for ‘full-time gamblers’ advising as many as 15 tips per day. If you might consider yourself a ‘full-time gambler’ (or at least someone with time to spare to follow a busy racing tipster) then the second review in SBC 93 will be right up your street. This is because it reviews in real depth a very busy racing tipster averaging 300 to 400 tips per month with a phenomenal record to advised prices. In total this stands to our proofed record as showcasing a 580 pt profit from 4191 bets with a ROI of 13.9%. Best of all this translates very well to betting bank growth or Return on Capital (ROC) at a figure of 484% over the 15 month period they have proofed to SBC. On average, you effectively would have nearly doubled your money every 3 months. A breakdown of performance by odds band – for example why the majority of profits come at 7/1 and over. The performance by class of race – for example why you should ignore class 1 or 2 races. A detailed study of 253 tips during April 2015 and how the advised odds on a tip stood up to scrutiny. We kept records of the odds available at various time periods – from the instant it was received to those on offer 15 and 30 minutes later plus SP. All of which combined helps us breakdown this tipster and reveal just who it is suitable for. You can read full details of all the above in the latest SBC magazine (Issue 93) which is available to download the instant you sign-up for a Smart Betting Club Membership. As a Smart Betting Club member you can also read hundreds more expert tipster reviews, strategies and interviews via our 9-year strong back catalogue of bookie-bashing content. Not only this but if taking up either a Gold or Platinum subscription you can also enjoy the peace of mind of our Money Back Guarantee if not satisfied once joining! Ensuring you can sign-up totally risk-free, with everything to gain and nothing to lose. Can you transform your betting with in-running lays? We all know that betting on horses can bring rich rewards. The best tipsters, and we review and monitor most of them, can give your betting a massive boost providing ROI levels of 15-20%+. But even the best tipsters have spells when they find the going tough. Wouldn’t it be nice if we could find a way in which we could soften the blow of the losing runs when they come along? And what if we could discover a method or strategy that allows us to set smaller bank sizes for the services we follow but not increase our exposure to risk by doing so? We set our expert SBC analysts the task of achieving these aims, and after extensive research and data analysis, they have come back with a simple but powerfully effective tool to add to the bettor’s armoury. Allow me to introduce to you, the power of…the in-running lay. How the in-running lay can transform your betting. These figures relate to a highly promising horse racing service that we put through the paces whilst compiling our in-depth review. We used a bank of 200 points for the purpose of simply backing each bet win only and allowing it to run without further intervention. We used a 100 point bank to see what would have happened had we placed a lay at Betfair odds of 2.5 in-running on each of the 929 selections, the lay being for half of the potential profit should the horse win it’s race. Immediately we can see a much improved strike rate of 30.8% when using in-running lays, compared to just 13.7% without. That is a massive difference when it comes to subscriber experience. A 30.8% strike rate means much shorter losing runs than those you’d experience with a strike rate of 13.7%. Perhaps the most interesting fact however, is that the ROC is only slightly lower at 69.9%, and that’s if only utilising our fairly crude banks of 100 and 200 points. The in-running lays have lost us a little bit of our Return On Capital, but they have provided us with a much smoother ride to profit. We kept this initial study deliberately simple. Over the summer, we will be analysing the data to work out exactly where the optimum price is for setting the in-running lay, and the optimum strategy. What are the optimum prices to set our in-running lays at? How can we maximise our betting banks? What is the optimum amount to win back with our lays? The usefulness of these findings is not limited only to the service we have reviewed in SBC93. The same principles can be applied to any of the top horse racing tipsters with services performing consistently at the very top of our performance league tables. I can tell you from personal experience too, that there is more than one way to skin the in-running cat. I have previously adopted a strategy with a top performing National Hunt racing expert that involved placing an in-running lay at 1.5 to ensure I made a portion of profit, even if the horse went on to lose. And believe me when I say that it is not at all unusual for a horse to reach that price and still not win it’s race! That’s the beauty of using in-running lays – you can make them do almost anything you want them to. Return your stake, ensure a profit no matter what once matched, use different pricing levels, etc., etc. Where they can be extremely useful is for those who are restricted to using Betfair for their racing action as a consequence of the high street bookies having closed all accounts. It is well known that the Each Way and Place markets on Betfair frequently lack liquidity, and as a result the prices often represent poor value. Well, it’s perfectly viable to use a lay to return an amount equivalent to that you would receive from the place part of an each way bet, and will do so simply if the horse looks like it might win. So, it could well be that if you’re not using in-running lays when backing horses on Betfair, you’re missing out. Certainly we at the SBC will be exploring this valuable angle further and feeding back all findings to our members in the very near future. And that is what the SBC is all about…finding angles, services, and strategies that lead to big profits for our members. We see ourselves at war with the bookies, and it’s vital we stay one step ahead of the old enemy. To see what we’re talking about, why not subscribe now and download the latest betting magazine containing reviews of two highly successful racing services (one of which has demonstrated 484% bank growth in just 15 months!) and an interview with one of our leading racing tipsters who explains how he makes money betting? This is the bookmaker apocalypse! Be a part of it and subscribe today! 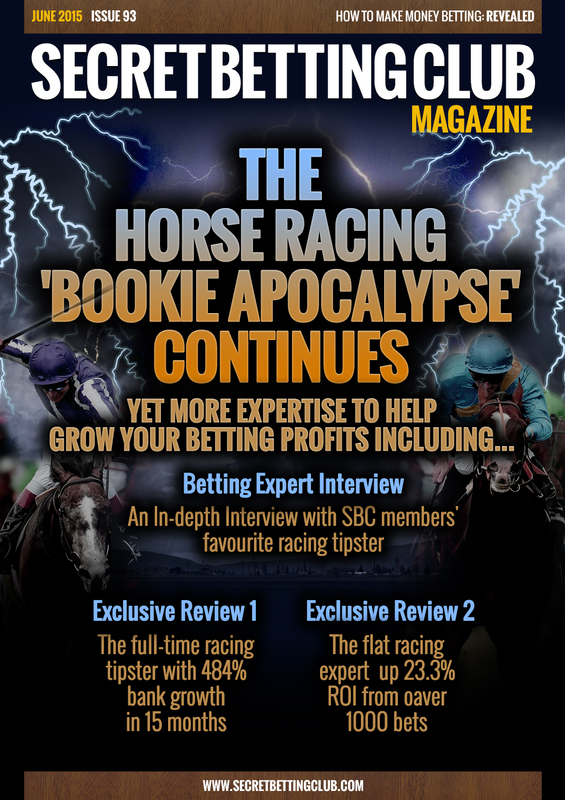 The Horse Racing Bookmaker Apocalypse continues today with the release of the very latest Smart Betting Club Magazine (Issue 93), featuring yet more expertise to help grow YOUR betting profits. If you have yet to make money betting on horse racing (or indeed you are looking for more help to improve existing profits) then the 3 major features in SBC 93 will assist you in this quest in a huge way! 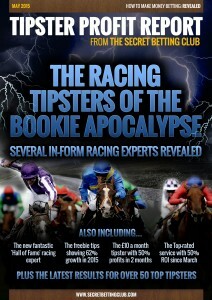 This latest magazine accompanies Part 1 of our Bookie Apocalypse (May’s Tipster Profit Report) which detailed several top racing tipsters tearing the bookmakers apart. More Betting Expert Secrets Revealed! Read our in-depth Interview with SBC members’ favourite racing tipster in our latest ‘How I Make Money Betting’ feature. Read Our Incisive & Independent analysis on this top expert. Exclusive Review 2): The flat racing expert up 23.3% ROI from over 1000 bets. Plus how you can get 6 months for free in an exclusive SBC members-only deal. You can read both this latest magazine (SBC93) and May’s must-read Tipster Profit Report with a Smart Betting Club membership and take your part in the ongoing horse racing bookie apocalypse. The instant you join you will be able to download both of these features PLUS access a whole load more expert reviews, strategies and interviews via the many other magazines & reports we have published in our 9 years operating the Smart Betting Club. Not only this but as if taking up either a Gold or Platinum subscription you can also enjoy the peace of mind of our Money Back Guarantee if not satisfied once joining! Ensuring you can sign-up totally risk-free, with everything to gain and nothing to lose. Britain’s Got Tipsters is the name for our new contest, where we are on the hunt for quality tipsters as yet unknown to the general public. Here at the Smart Betting Club (SBC) we firmly believe there are many as-yet-undiscovered betting experts out there, who simply need a helping hand and the right platform to showcase their skills. Therefore to help root out as many top tipsters as possible – we have set up this special Britain’s Got Tipsters contest, where we are offering the winner the chance to win a paid contract to supply betting advice to SBC members. The winner will then join our existing network of expert tipsters. Our Horse Racing Britain’s Got Tipsters competition will last approximately 3 months, running from June 29th to September 26th 2015. After inviting applications, we shortlisted 12 tipsters to take part, each of whom is proofing their bets live on the SBC private members forum. Unlike other talent shows we won’t be having ‘eliminations’ or knock-out rounds as we are keen to allow each tipster the time to prove their ability. We feel that over a 3 month period, we will be able to get a very real flavour of just how each tipster works, their racing expertise & professionalism, attention to detail and of course – if able to showcase a profit. As all of these bets will be posted live on the SBC forum each day so those of you who are active SBC members will be able to follow each competitor and their progress….Plus if you want to, the actual tips themselves. To help keep track of performance, we are also posting regularly updated results spreadsheets for each tipster and blog posts to mark their progress. The ultimate winner will also be decided by an SBC panel of experts, who will monitor and observe each participant over the full 3 month period. What It Will Take To Win! The goal naturally is to find not just any old tipster, but the most serious, professional and reliable expert going – exactly the type of tipster you might feel confident about following with money. To ensure the competition is fair, we are only allowing tipsters to put forward single horse racing bets either to win or each way plus lay bets (meaning no pie-in-the-sky accas that might get lucky). We are not allowing Best Odds Guaranteed prices, nor the usage of any other special bookmaker offers. All lay bets are being settled at Betfair SP minus 5% commission. Each tipster is only allowed to quote prices from a set group of ‘approved bookies’ (so definitely no Betfred or Stan James) and availability of any advised odds quoted is double-checked for accuracy. All tips at advised prices can only be quoted from 9am the day of racing. After the 3 month period has elapsed, the SBC panel of experts will decide upon the ultimate winning tipster. He or she will then be offered a paid contract to supply their tips exclusively to SBC members. All SBC members can follow the tips from all 12 tipsters for the lifetime of the contest for free as part of their Smart Betting Club subscription. We will also be updating on the progress of those taking part for those of you not available to follow their tips each day so keep an eye out of that. We very much hope that through this competition we will open the doors to finding a whole new wave of genuine betting experts, much like the 30+ professional racing tipsters we report back upon each month in our Tipster Profit Reports. The goal as ever – whether via this competition or the Tipster Profit Reports is to help ordinary people make money betting, whether that is for the first time or as part of an ongoing quest. Read more about how the Smart Betting Club can make you money betting, including how you can join us with the benefit of a risk-free money back guarantee. Last Saturday’s Champions League final between Barcelona and Juventus might have signaled the traditional end of the European football season, yet will be still be plenty of action to bet upon over in South America this June and July – with the start of the Copa America tournament. Featuring all the South American heavyweight teams and players, the Copa America starts on Thursday the 11th on June and is taken deadly seriously in South America – its effectively their equivalent of the Euros, thus ensuring there will be plenty of competitive football for us to bet upon for the next month. Already the bookies are getting busy putting together all kinds of special offers and deals but for those of you unfamiliar with South American football and the Copa America, we have put together a special guide to help explain it all. If you are having a bet in the Copa America this June and July, first of all make sure you download our free Copa America Football Betting System! Proven to work and make a profit on International Football (It has made £457 at £25 stakes in the last 2 World Cup’s combined) it is available catch-free to all! Simply visit our special Copa America Football Betting page to grab your copy now! If you’re not familiar with the Copa America tournament, then I hope you soon will be. It encompasses talent, passion, skill, rivalry and all the colour of a World Cup, with some South America flair. This year’s edition will be held in the wonderful country of Chile, and it’ll be the 44th edition of the competition. It’s a particularly exciting time to start following the Copa, as this is the first of two tournaments taking place in the next 12 months. With 2016 due to be the 100 year celebration of CONMEBOL, the federation has organised a second Copa America to take place in the United States of America, and unusually it will feature 16 teams from two federations. This year’s edition features just 12 teams, with two of those being guests from the North American region governed by CONCACAF. Mexico and Jamaica are the special guests of this year’s Copa, but it’s hard to expect much from either nation. Whilst it may not be as well covered as the likes of a World Cup or the Euros over here, the Copa is huge. It was first hosted all the way back in 1916, 100 years ago. It is the oldest active international continental football competition. The first edition of the competition saw just four teams compete in a round robin format. Argentina, Brazil, Chile and Uruguay were the competitors, and it was the Uruguayan’s who lifted the trophy on Argentinean soil. It was the first of many trophies for a nation that has exceeded all expectations for its size, and Uruguay went on to add a further 14 Copa’s to their trophy cabinet, including the most recent edition in 2011. In the earlier years, the competition was almost a yearly event with the same four teams competing. On occasion, Paraguay would replace Chile. Since the continual group of the tournament, it’s become a four yearly event that’s not featured on the FIFA Calendar. It took Chile until 1926 (10 Copa tournaments) to register their first win in the competition, but as hosts of this year’s event, hopes are high. It’s no secret that Brazil are one of the most successful nations in the history of our wonderful sport, but that aside, the South American region continues to grow stronger and stronger. At the start of play, four of the 12 sides featured rank in the World Top 10. Argentina (2), Colombia (3), Brazil (6) and Uruguay (8) are the big four here, but the draw dictated that Chile could only meet two of those at best, avoiding Argentina and Brazil. The host nation, as is tradition, earned the right to enter themselves in to pot one of the draw along with the two highest ranked teams, Argentina and Brazil. That means they cannot meet each other in the group stages, and the draw went as follows. Group A is home to the hosts, and Chile arguably have the easiest group as the home nations conveniently often do. They will meet Mexico, Bolivia and Ecuador. Group B has pitted tournament favourites Argentina against Uruguay, Paraguay and Jamaica, making their progress a foregone conclusion also. Group C has Brazil facing Colombia, Peru and Venezuela. On paper you’d think qualification will be easy for the Brazilians and, well, you’d be right. The group stage naturally follows in to a knockout competition where we’ll see the following matches. From there, the semi-finals, final and third place playoff game are played until we have our winner and runners ups. Argentina: Argentina are everyone’s favourites to win the tournament, and the bookmakers support that thought. There are three teams capable of topping the favourites, though, so it’s not a foregone conclusion. It has to be noted they haven’t won the Copa since 1993, and on four occasions since haven’t even made the final four. Their squad this year is indeed a terrific one, but it’s been a very long season for the likes of Mascherano and Messi, and I do question the quality of their defence. Brazil: If Argentina are to exit the competition, then Brazil will naturally become the favourites. Again, you can see why, but I’m not convinced. They have 7 Copa titles which is second to only Uruguay, but big tournament failings have been a problem during recent tournaments. Elimination to Paraguay in the last Copa and embarrassing failings in their own World Cup leave Brazil with plenty of questions to answer. Bolivia: Bolivia are sandwiched between Argentina, Brazil, Chile and Colombia in our preview. There’s probably a joke to be made there, because they’ll be nothing more than an irrelevant piece of the puzzle stood in the way of Chile, Mexico and Ecuador in their group. They aren’t bad enough to label whipping boys, and they may even had a surprise in them. In reality, this group belongs to Chile and Bolivia will have a tough task against both Ecuador and Mexico as they battle for points and goal difference to secure second place. Bolivia did recently come close to stunning Chile in Antofagasta, but I don’t expect that with the stakes this high. Bolivia tend to concede too many goals and only prosper in ridiculous altitude. Chile: The hosts are going to come in to this tournament as considerable underdogs to Brazil and Argentina, but they have what it take to beat them. They fell narrowly short against Brazil in the World Cup, but they gave it a real good go. On their own turf I think they have the beating of them. This is a team that has been improving for years and building towards this tournament, and they could push themselves in to the World’s Top 10. Colombia: Much like Chile, I think this team is undervalued going in to the tournament and they’ll be happy about it. Rodriguez is obviously the man of the moment, but it’s full of electric pace and raw attacking talent. Colombia have more options that ever with the continual emergence of their stars in Europe. Ramos, Rodriguez, Cuadrado, Sanchez, Guarin and Quintero all have a part to play. They’re in particularly good form having won six games coming in to this, and they’re more than a contender to win the competition. Ecuador: Ecuador are one of many in a group of teams that it’s hard to expect that much from. We’ve seen in recent years that it’s not always easy to write off the true underdogs in this competition, but they’re in a tough group and they have a big job on their hands. I do however think they present some value, as Mexico shouldn’t be favoured to finish above them in the group stages. Qualification for the knockout stages isn’t out of the question, but don’t expect anything more. Jamaica: Entering the tournament as the lowest ranked team, Jamaica’s fate is sealed. I understand how it all works when it comes to inviting special guests, but if you’re going to invite teams from CONCACAF with any expectations, you need to be inviting two of Mexico, USA or Costa Rica. They’re in a group with the world number two and whilst I expect hearty performances that epitomise Jamaican spirit, I expect them to go home on the back of zero points and some rather harsh results. Mexico: The Mexicans have long been the dominant force of the CONCACAF region, but I believe that un-official title has been under threat by the United States for several years now. Mexico are still a strong team with the ability to compete at this level, but I think they’re truly out of their depth against the likes of the big four. They’ve been handed a group where qualification is possible and they’ve even favourites to take second. Despite that, I think they’ll fall short against Chile and Ecuador, but they’re a very entertaining side that should provide us with plenty of drama. Paraguay: It wouldn’t be the first time Paraguay pulled off a shock in winning the Copa America, but it would be just that this year – a monumental shock. They’re facing an up-hill task from the start as both Uruguay and Argentina will want to be on maximum points before facing each other in game two. Recent failures to score against Mexico, Costa Rica and the UAE, coupled with conceding multiple goals against China, Korea and Peru demonstrate Paraguay just aren’t good enough. Peru: Much like Paraguay, the best Peru can probably hope for is a result against Venezuela to try and steal the third place in the group, which could be enough to qualify. They’ll likely be the next best thing as Brazil and Colombia finish on at least six points and battle it out to win the group. Despite that though, Peru lost to Venezuela just seven weeks ago, and the recent head to head has seen them win back to back games against Gareca’s men. Uruguay: The defending Champions have a record 15 titles to their name. Unfortunately for them, their draw means there is no chance of them slipping under the radar. They’ll do well to finish above Argentina, and a meeting with Brazil or Colombia is likely. It won’t phase them and they’re capable of beating any of those teams on the way to another title. However, it’s a big ask to conquer all of those teams in the process. The good news is they can say they’ve won their last meetings with Chile, Argentina and Colombia. The bad news is they’ve lost their last five meetings with their most likely knockout opponent, Brazil. Venezuela: Whilst they aren’t the lowest ranked team in the tournament, they’re by far the lowest ranked team in their group. As we’ve already mentioned, first or second is out of the question. Goal difference could be crucial to make a push for third place in the group, and they’ll be glad their recent meeting with Peru ended in victory. Being that goal difference is so decisive, I wouldn’t fancy them to qualify even if they did finish third. It should be a competitive meeting with Peru, and goal difference obtained in the remaining games should be damaging. It’s going to be a fantastic tournament as always and whilst Argentina and Brazil are the favourites to lift the trophy, I really do think the winner could come from one of Colombia, Uruguay or Chile. This tournament never fails to deliver and despite Brazil and Argentina having double figures in titles between them, there’s always a surprise to be had, even in the final. I don’t see any true outsiders making a run this year, but Ecuador or Mexico are the ones with potential should they sneak through in second place. As a betting man, I wouldn’t want to bet against the likes of Argentina or Brazil, but I wouldn’t want to bet on them either. I think when all is said and done, Chile will do no worse than win the third place play-off on home soil. Whoever wins or whoever you’re betting on, it promises to be another wonderful Copa America tournament.